10 April 2018-- A group of unemployed workers at Iran Cylinder Company protested against the closure of the company on Monday, April 9, 2018. The Iran Cylinder Gas Company, which operates in the field of producing various capsules and gas cylinders in the Ray city of Tehran , has been shut down since April 3rd due to its problems in production, and all its workers are unemployed. Iran Cylinder Gas Company is one of Persi Iran Gas Co.’s subsidiaries. and Tamin Petroleum & Petrochemical Investment Co. (TAPPICO) that was registered on November 20, 1963 in Iran. The main activities of the company are the production of any type of gas stove, gas burner equipment, liquid gas cylinders, car LPG cylinders and other industrial products for domestic use and export to the overseas, as well as import of any materials and supplies , machinery and equipment for the subject matter. 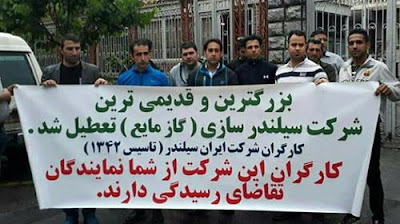 Workers at Iran Cylinder Factory, who have an average of 15-year work experience, said that after the Nowruz holiday 80 workers of the factory are faced with closed doors at the factory and are now unemployed and have no definite status.